I love this dish, I love it a lot. I love when something so simple can taste so good. Many times you try new recipes and they can fall a little flat. Some you even tweak, as they are worth making a little extra effort to improve them. This one, was just perfect. My family to, loved this. But not each one of them liked all that was in there. But was great was that it still catered for everyone. I have one child that doesn't eat capsicum, so he left the capsicum, but ate the rest. One doesn't like olives, so don't eat an olive, there is so much choice in this dish and they all work together. I loved everything about this dish, the simplicity, the flavour, the smell in the house, the chicken, the vegetables, the feta, the lot. 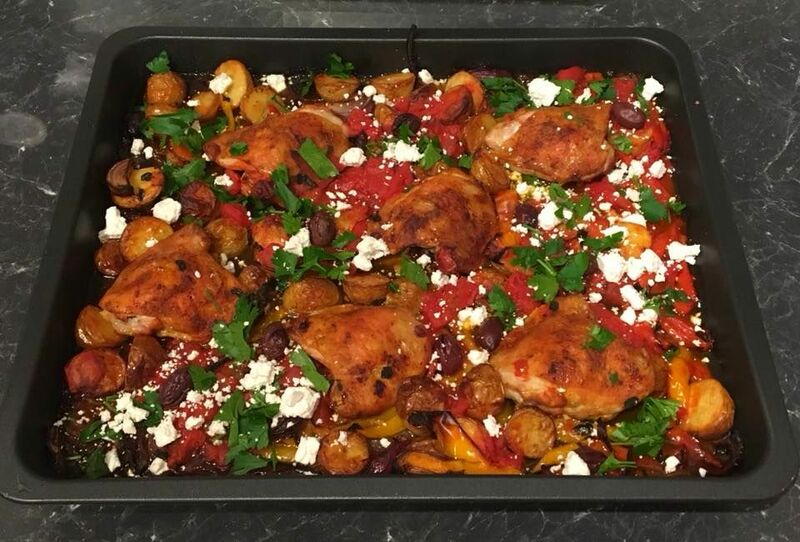 The original recipe called this Greek Chicken, I felt the need to change the name as I felt many Mediterranean families would include all these ingredients in their diet. My parents are Croatian and I grew up on all these ingredients, the Italians I know, eat them to, so I felt Mediterranean was a more fitting name. Whatever it is called it is a great dish, one your family will love. Place the potatoes in a pot of cold tap water, bring to the boil, cook for 5 minutes. Drain. You will need a large baking dish for this recipe. Place the 2 tablespoons of the oil in the baking dish, scatter over the potatoes, scatter over a little of vegeta (like a seasoning), toss in the oil, season with some salt and pepper. Bake for 30 minutes. Place the chicken in a large bowl, add the paprika and toss to spread the paprika and seasoning over the chicken thighs. Add the onion, capsicum and garlic to the potatoes, toss to mix it about. Make gaps between the vegetables and add the chicken thighs in the gaps. Drizzle with the remaining 2 tablespoons of oil, season well with salt and pepper, sprinkle with the oregano. Bake for 45 minutes. 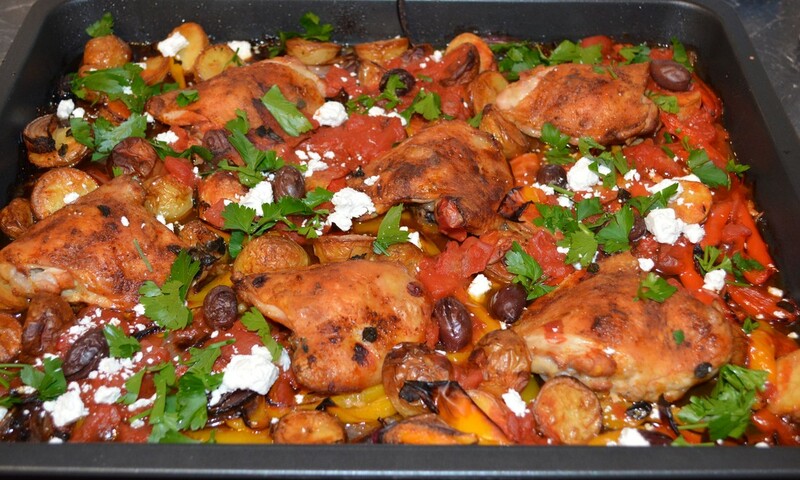 Add the tomatoes and olives around the chicken, cook for a further 15 minutes, or until chicken is cooked through. Serve with parsley and feta.